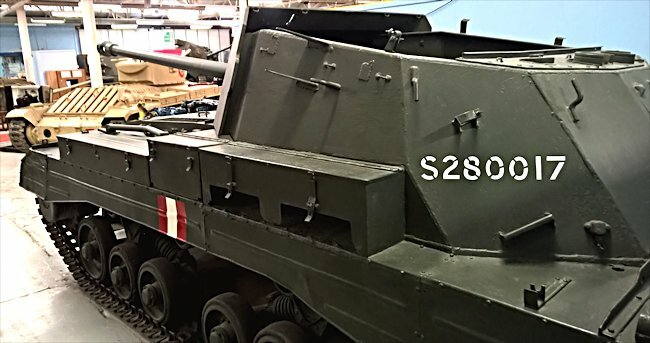 This surviving British WW2 Archer Self Propelled Gun can be found at the Tank Museum in Bovington, Dorset, England. It is a very strange design as the big 17-pounder gun is pointing backwards over the rear engine compartment. The only British anti tank gun that could penetrate the armour of all the WW2 German tanks, including the much feared Tiger and Panther, was the 17 Pounder (76.2mm) that was later fitted to the Sherman Firefly. Until the Sherman came along the British did not have a tank big enough to carry its large size. The 2 pounder and 6 pounder anti tank guns fitted to many British tanks were not up to the job of stopping enemy tanks at long range. 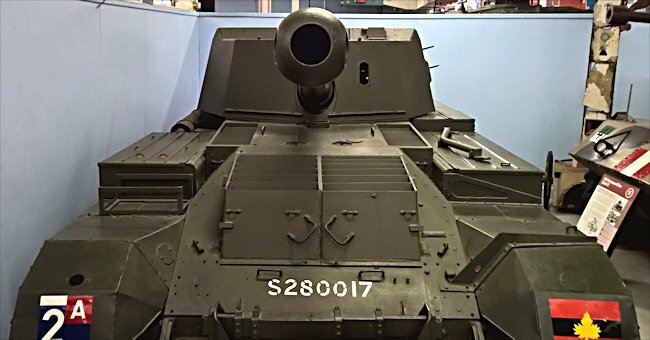 There was a desperate need for a temporary stop-gap solution to be devised until a large enough tank and turret could be constructed to fit this gun. 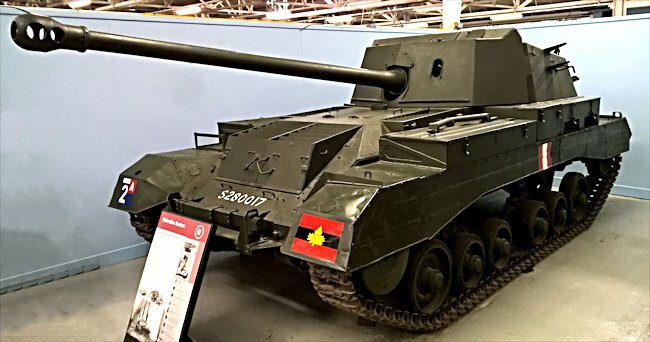 British Tank builders Vickers-Armstrong Ltd came up with the idea of adapting their Valentine tank chassis so that it could accept the gun. The Valentine tank turret was far too small to take the 17pdr. It was removed. They found it was far too long to fit it facing forward. One of the engineers came up with the idea of fitting it backwards. 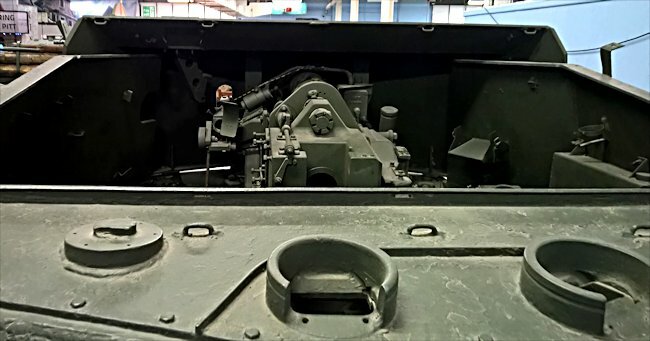 The driver sits at the front as normal in a Valentine tank, but with his back to the gun. In the picture above you can see the holes where the driver's forward and side diving telescopes would have been fitted above his head. The Archer could not be fired on the move. The driver had to leave his seat when the gun was fired because of the lack of room and the gun recoil. This weapon had a few good features. It had a very low profile so it was easy to conceal and a hard target to spot unlike some of the other British Self Propelled guns like the Bishop and Sexton. It could also get away quickly. The Archer SPG tank destroyer's armour was not very thick. It was not designed to be used in close combat with enemy tanks. It was intended to be used in a support role. It would fire at an enemy target in the distance and then quickly change position to get into cover. This vehicle's method of operation was 'shoot and scoot'. It could only go slowly in revers to position the gun to face the enemy, but it could go a lot faster forward to get out of trouble. It was a good ambush weapon. The crew could fire at a target that appeared in front of its gun and then drive away without having to turn around. It got some very strange look as it drove around on the roads in England and later in Europe after D-Day. It appeared to be going backwards because people were used to seeing guns pointing to the front of vehicles, not backwards. Production started in 1943 and the Archer entered operational service with Royal Artillery units in 1944. The Archer had a four man crew: driver, loader, gunner and commander. It had a top speed of 20mph (32kph) on the road and 8mph (13kph) across country. Its fuel tank could hold 50 imperial gallons (230 litres) which gave it an operational range of about 140 miles (230 km). Each Archer was issued with a .303 Bren Light Machine Gun. There was storage space for only 39 rounds for the main gun. Vickers-Armstrong produced 655 of these vehicles between March 1943 and May 1945. They saw active service in North West Europe and Italy. The Egyptian Army used them after World War Two against the Israeli army. Where can I find other preserved Archer SP anti-tank guns?